Brazilian football was on its knees in 2014 following the incredible 7-1 humbling by Germany at the Maracana. But as bad as things got during their home World Cup, Brazil were always going to bounce back. The speed at which Tite has made the national team a force again has been mightily impressive. He has handed prominent roles to several young players, with Marquinhos, Casemiro, Coutinho and Gabriel Jesus all becoming central figures. 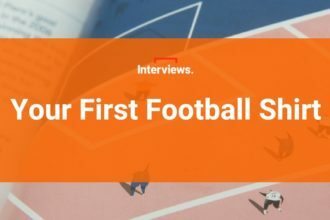 While that group have already made big moves to Europe, there are plenty of others catching the eye in Brazil’s top flight, and senior international recognition might not be too far away. 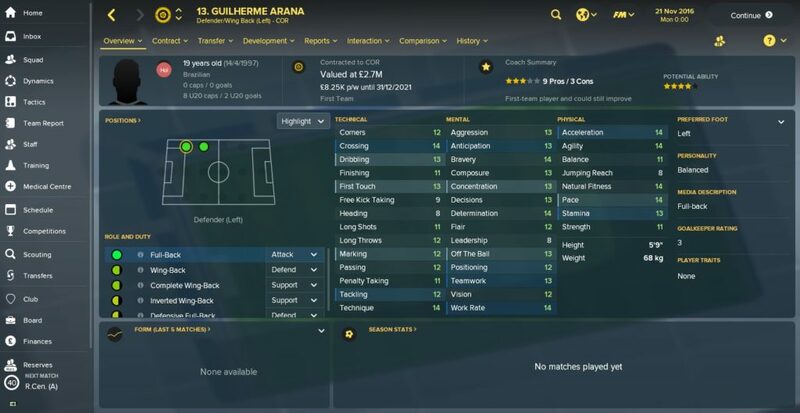 Here are five superb Brazilian stars that you should be looking at in FM18. It wouldn’t be outrageous to say that the current three best left-backs in world football all hail from Brazil. Messrs Marcelo, Filipe Luis and Alex Sandro are exceptional and have been at the top of their game for some time. With Sandro the youngest of the three at 26, Brazil should be pretty set in that position for a few years, but one player who will be looking to break into the squad in the future is Corinthians’ Guilherme Arana. Like the aforementioned trio, Arana is most comfortable when he is on the front foot and galloping up the pitch into the final third. He is quick, has good stamina and possesses the work rate required to retreat back into his own half after flying forward. His standout stat, however, is his crossing, which begins at 14/20. For a 19-year-old to have that crossing ability is extremely encouraging, particularly when you consider that established players such as Jordi Alba, Danny Rose and Faouzi Ghoulam all possess the same rating. Brazilian names are just great, aren’t they? 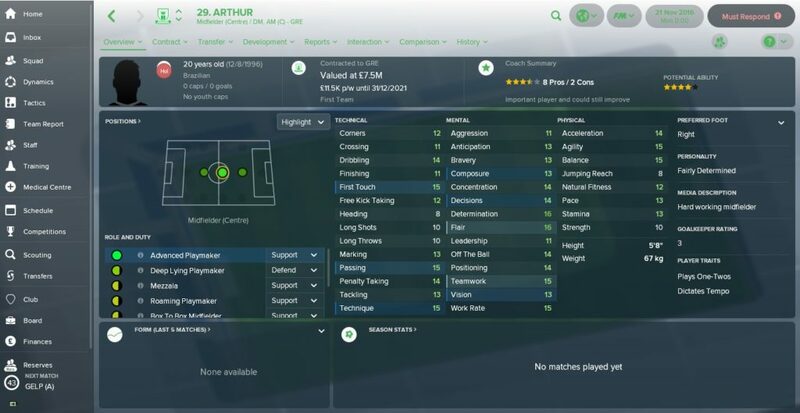 We’ve had Jo, a couple of Freds and a Bernard, and now there’s a burgeoning young midfield prospect who goes by the name of Arthur. Arthur has made quite a name for himself this year, helping Gremio reach the final of the Copa Libertadores. So impressive have the 21-year-old’s performances been, he was even called into Tite’s squad for Brazil’s final World Cup qualifier against Chile in November, although he is still yet to make his full debut. 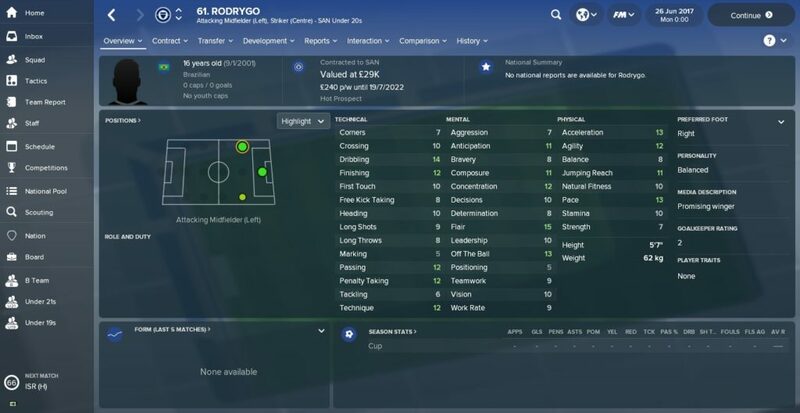 On FM18, his stats really do stand out, and there is no discernible weakness to his game. 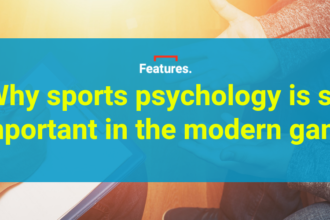 Technically, he is an assured passer with a velvet touch; mentally, he has a penchant for flair, 20/20 vision and the industry to go with it; while physically, he has a low centre of gravity and excellent balance. He’s got the lot, this kid, so snap him up quickly. I really like Wendel. 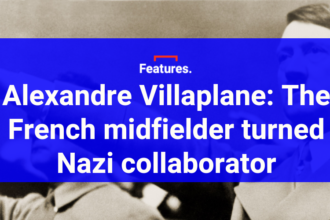 The primary reason is that he’s an exceptional midfielder in the making but secondly, whenever I see his name pop up on my laptop screen, my mind immediately wanders to the classic Arrested Development track Mr. Wendal (come on…it’s close enough). If you haven’t signed Wendel on FM18 or listened to Arrested Development, then do both, right now, simultaneously. You won’t be disappointed, I promise. As you can see from the screenshot, Wendel is perfectly suited to playing as a carrilero – one of FM18’s new player roles – which essentially means he shuttles from side to side in central midfield, linking play between your defensive base and attacking players. Given the physical demands placed on such a role, stamina is key, and it is no surprise to see that Wendel has an almost never-ending supply of the stuff. Indeed, his 16/20 rating for stamina is his standout attribute at the start of the game. The best thing about Wendel, though, is that he has a very complete skill-set across all technical, mental and physical attributes, which means he’s able to function effectively in all manner of midfield roles. Santos have a pretty handy track record when it comes to producing world-class attacking talent. Pele rose through their ranks in the 1950s and left an indelible mark on the beautiful game and Neymar followed in his footsteps over half a century later. All Brazilian clubs have to invest time and resources into developing young players, but Santos have an undeniable history of success, and arguably the hottest prospect currently on their books is 16-year-old Rodrygo. A quick trip to the FM18 data editor reveals that the teenage winger/forward has a ‘-9’ potential, meaning if he’s developed correctly he could reach a maximum ability rating of 180/200. Only five players on FM18 have an ability in excess of 180; Cristiano Ronaldo, Lionel Messi, Manuel Neuer, Luis Suarez and Neymar himself. That highlights just how promising Rodrygo is and, even if he doesn’t reach those supernatural levels, he should, at the very least, be an extremely good player in a top league. The world’s biggest clubs will form a not so orderly queue to sign him after a year or two so make sure you’re also in the mix for his signature. Arana, Arthur and Wendel can all be thrust straight into a first-team squad at virtually any major club in Europe, but 16-year-old Paulinho (no, not that one) is more of a work in progress. If you got swept up in the mini-hysteria that accompanied England’s U17s winning the World Cup recently, you might have noticed Paulinho in the semi-final against Brazil. While England went on to win 3-1 thanks to Rhian Brewster’s hat-trick, Paulinho really caught the eye in the first half with his intelligent movement and skill on the ball. 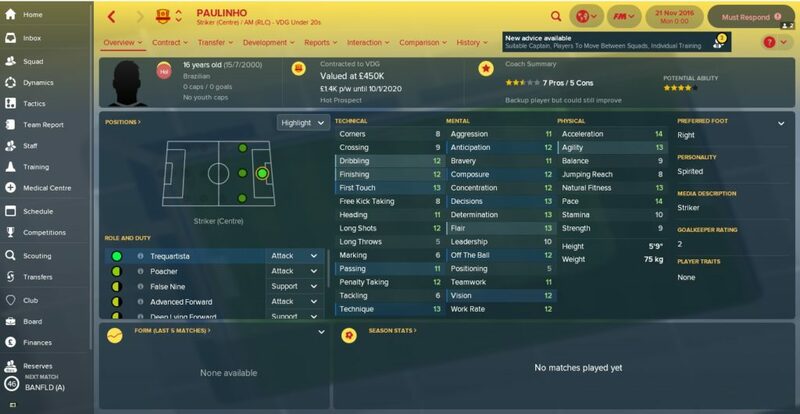 Thanks to his performances on the international stage this calendar year, Paulinho is rated highly on FM18, boasting some highly promising stats for one so young. In the long run, he will probably end up playing through the middle as a central striker, but if you do sign him, you should look to rotate him around the three attacking midfield positions to sharpen his technical attributes. And who knows, if he fulfils his vast potential, this Paulinho may too end up at Barcelona via an ill-fated spell in North London.